Superstar Yarn and Kathy C.
I am always trying to improve my photos for the blog. I find that the blogs I visit often are more photo journals than alot of text. I am very proud of the way this picture turned out. Kathy has been working for River Colors for 11 years now and I was very taken by how she looked in this hat. She has never been one of those people that wanted to see herself out there on the internet so I was thrilled when she agreed to let me do this posting. The yarn for this hat is the Queensland Superstar. The yarn is a bulky chainette blend with a sprinkling of sequins that you can see sparkling in this picture. 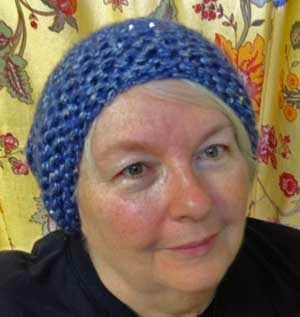 The hat is a quick project and takes two hanks of the yarn. I took a free pattern for the yarn and rewrote it for knitting the hat in the round rather than flat. My pattern is here. The original pattern which includes a scarf is here.